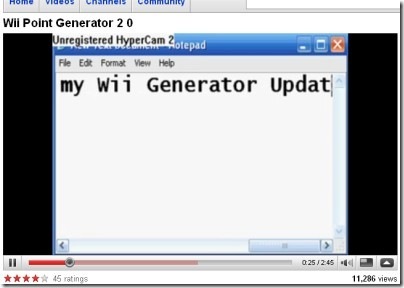 There are a few YouTube videos promoting a product called Wii Points Generator. This product is supposed to create Wii points (Wii is Nintendo’s game console). The video shows a link to download a program called generator.exe. The program does not generate any Wii points. It’s a scam that installs a trojan that then downloads more malware. There are also videos on YouTube that claim to show you how to create XBox points and iTunes gift cards. These are also scams that install viruses. Thank you so much! I was searching for this kind of program so I’m just glad I didn’t download it.